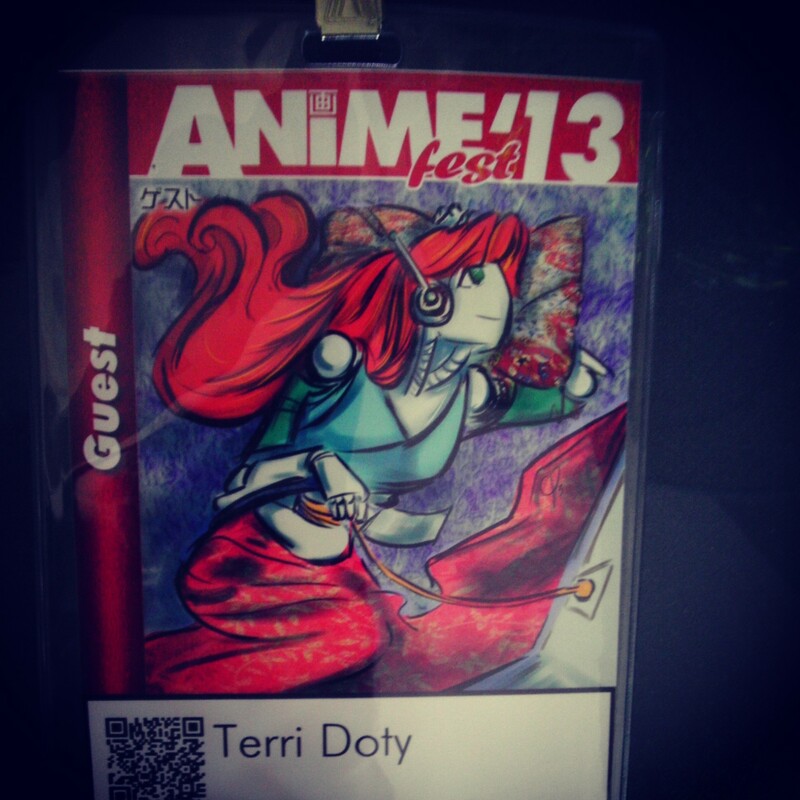 AnimeFest was my third convention of August (hooray for sleep deprivation). I’d been a guest in 2011 and was excited to be asked back. AFest is probably one of the bigger cons that I’ve gotten to go to and it just so happens to be in downtown Dallas (only minutes away from mi casa). Since my last visit, the con has changed quite a bit (venue change, more staffers/volunteers/programming, etc). Other guests included: Stephanie Young, Alexis Tipton, Greg Ayres, Amelie Belcher, Greg Wicker, and many other fantastic individuals! Okay, so this might not exactly be a highlight of the convention itself, but it was quite funny (least for me). As I’ve mentioned more than a few times, I used to work at a music shop. Needless to say, you become familiar with brand names, especially if you spend a good chunk of time working on displays (yay, merchandising). 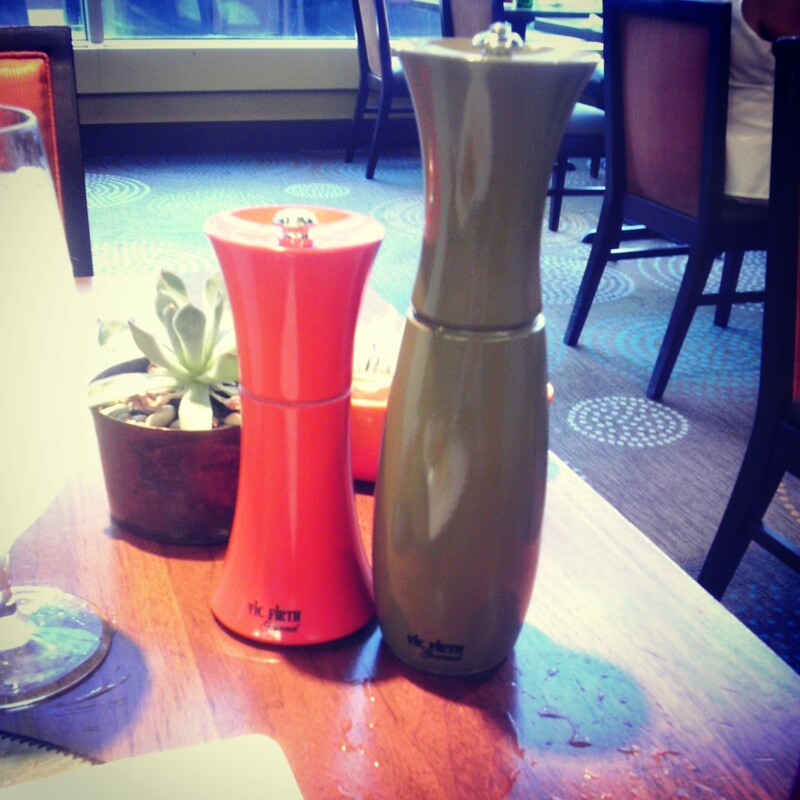 I was more than a little surprised to see Vic Firth salt and pepper grinders in the restaurant downstairs, Vic Firth Gourmet (wonder if they have anything featuring Neil Peart). Thought former coworkers and musicians would get a kick out of that, I know I did. So… I’ve made it no secret that I’m not a fan of Sailor Moon. I know, I know… “How could you not like Sailor Moon? !”… It just wasn’t the show for me growing up (didn’t know I liked anime until I found Ghost in the Shell), but I can see why it’s popular though. Despite my not being a fan, I was still pretty excited to be at a convention with Linda Ballantyne (Sailor Moon), Susan Roman (Sailor Jupiter), & John Stocker (Voice Director). I even got to participate in a couple of panels with them (along with Alexis & Stephanie). It was interesting to hear the differences in vocal styles, techniques, etc (according to them, they do things a bit different in Canada). Plus, Linda and I geeked out about Black Butler. That was cool. Along with my love of cosplay, I’ve had a deep sadness related to it (yes, I’m being overdramatic)… I’m fully aware that this might come off as egotistical, but I have never seen someone cosplay as one of my characters. Thing is, I see photos of peeps all the time as Virgo in Fairy Tail, Alice in Ōkami-san & Her Seven Companions, and a few others. 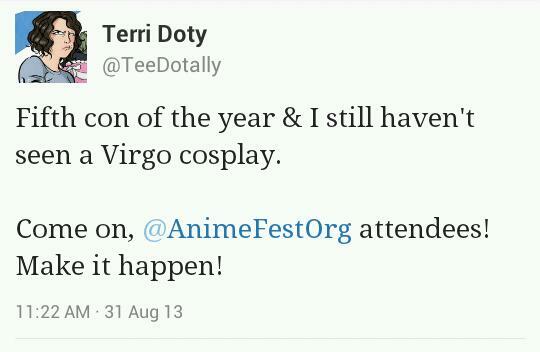 I’ve just never seen any of this at conventions that I’ve attended. Success! Sweet, sweet victory! 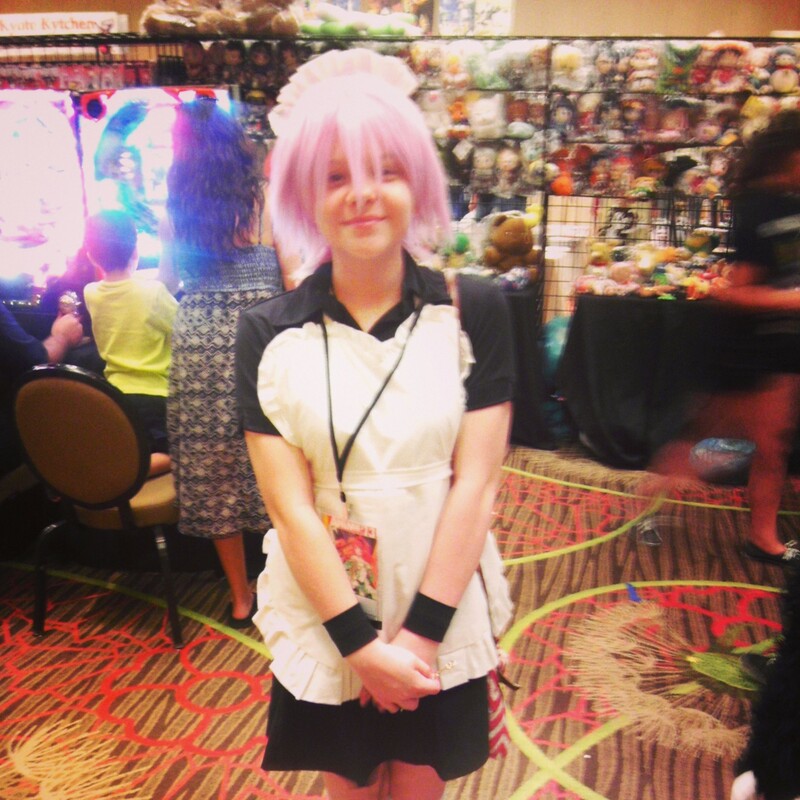 A mere two hours after my little post, I spotted a Virgo in the Dealers Room! I probably scared her when I ran up to her, but I just so excited (wonder if she follows me on Twitter). She was adorable and we both geeked out about Fairy Tail. I have no regrets about pestering her for a photo! The dealers room was full of temptation: posters, action figures, geektastic shirts (got a Batman shirt), and much much more. 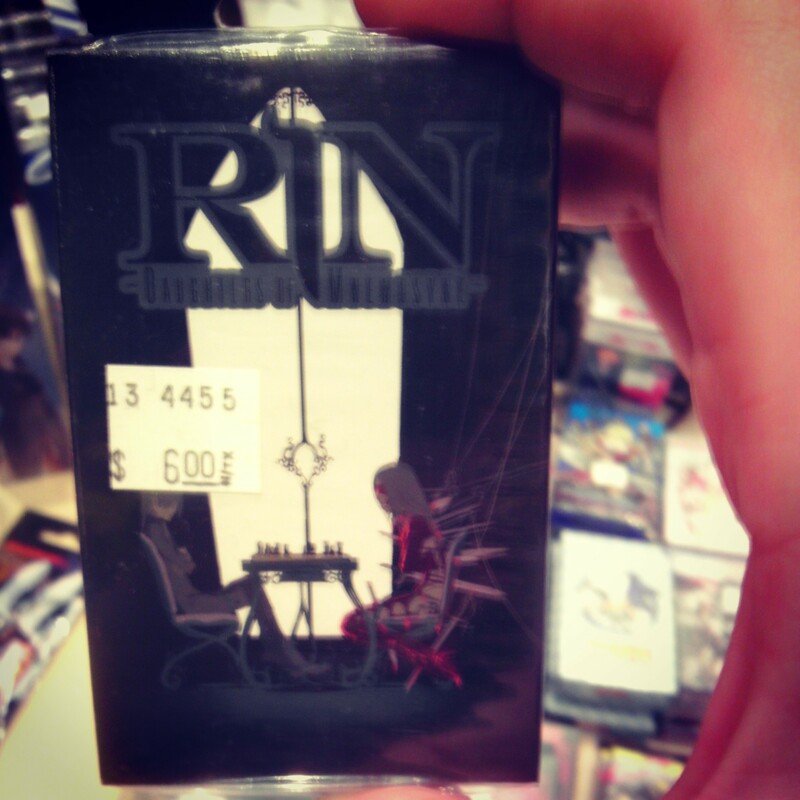 Shortly after my Virgo encounter, I found RIN: Daughters of Mnemosyne playing cards… Not familiar with RIN? It’s just this awesome anime that me and my amigo, J. Michael Tatum, directed. As much as I love this show, any time I see merchandise for it I’m baffled. For those that don’t know, RIN: Daughters of Mnemosyne is about an immortal detective that tends to attract disaster and scandal (that is the best way to describe it for the time being). Totally the kind of show you need playing cards for (seriously, I regret not buying them). I’m gonna admit this right now, I don’t remember the details exactly so forgive me if I get some of the facts wrong. During one of my autograph sessions, I met a fan of That Anime Show (always love meeting a podcast fan). This particular TAS listener let me know how much he loved the show and how much it meant to him. While he was stationed elsewhere, he used podcast episodes to stay connected to the world he knew back home. He said it helped when times were tough. The way he put it was more eloquent and it actually brought tears to my eyes. When he asked me to sign his iPod, I had to hide my face (FYI: I rarely have a cry like that). I never thought my lil’ podcast would be so important to someone and I am deeply touched. 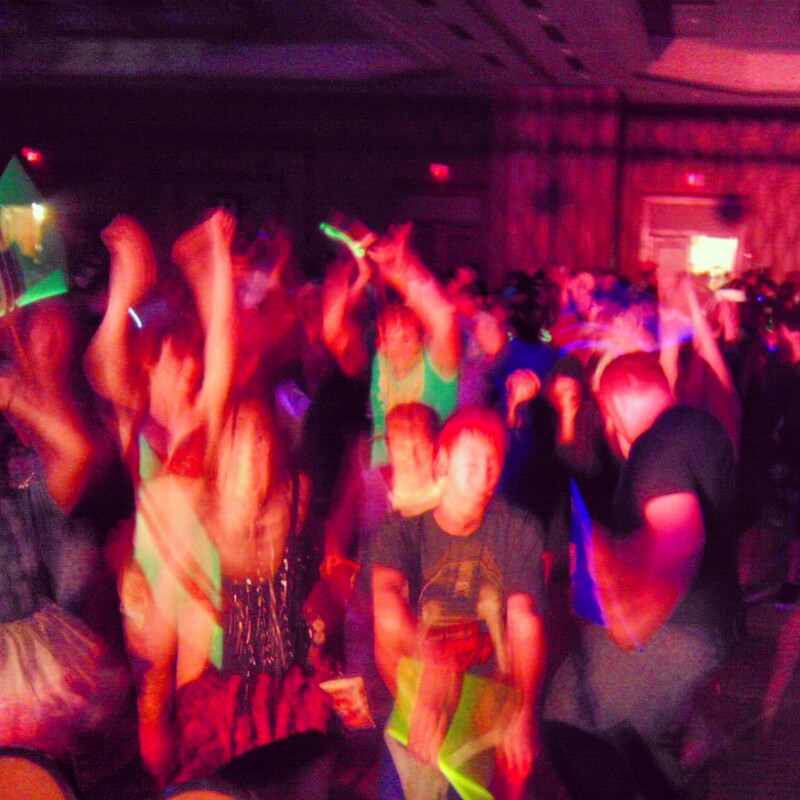 You’ve never experienced the DJ skills of Mr. Greg Ayres? YOU ARE MISSING OUT! Seriously. Not just saying this because he’s a friend of mine. This guy is the real deal, not any ol’ schmuck armed with an iTunes playlist and crap-tastic speakers (better known as a Laptop DJ). Greg and I have done a few conventions together, so I’ve had the pleasure of going to a few of his dances. Alexis & I danced on stage for a bit, then we joined the crowd. After about 45 minutes, we admitted we were old and joined Mike McFarland at the bar. Shout out to Courtney, Kelbie, Caleb, Kara, & Jason! These lovely folks joined me for a beverage (or three) on Sunday night and I didn’t bore them to tears! Win! SO MUCH FUN! I don’t know… I’m sleepy. Terri!!! It’s Courtney!!!! Thanks so much for the shout out! We loved hanging with you Sunday night and listening to your awesome stories! It really was one of our favorite highlights of the weekend! Thank you!!! I tried to the other day, but construction was annoying. I’ll be up at the studios on Monday, you might see a Terri! You haven’t seen the last of me, lady! Oh wow! Kelbie linked me to this and I had NO idea you’d mention our little group of pals!! It was a wonderful time gettn to talk to you, and I (better yet we) hope to see ya next time around! Rock on Terri 🙂 Thanks for lettn us join you! Thanks for being great company! You guys were a lot of fun to hang with! This was such a fun time 🙂 Thanks for letting us all hang with you for a bit! Your stories were hilarious and totally made up for the fact that the schedule messed up for the lack of karaoke that night. This chill time was way better <3 Hope to run into you soon! I was fully prepared to join in karaoke, but hanging with you guys was just as fun (if not more so)!